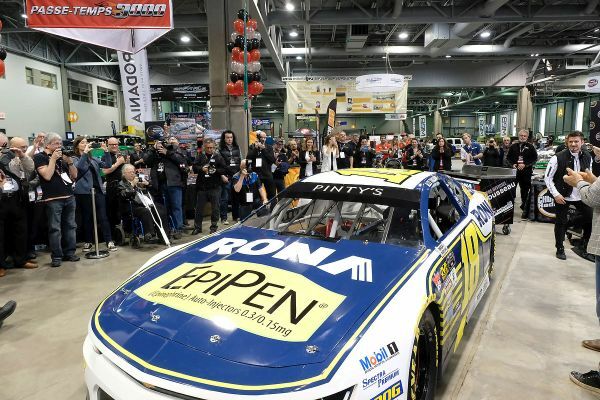 In the company of distinguished guests, racecar driver Alex Tagliani announced on Friday at the Salon de l'Auto Sport in Quebec City, that RONA will join EpiPen, St-Hubert and Spectra Premium as sponsors for the 2018 and 2019 seasons. Joined by Charles Valois, Vice-president, Marketing Central at Lowe's Canada, Halima Benmiloud, EpiPen Brand Manager at Pfizer Canada, Richard Scofield, President, Les Rotisseries St-Hubert, Gilles Tremblay, Director Communications and advertising at Spectra Premium, Robert E. Duval, Senior Director, International Business Development & Partnerships | NASCAR, François Lambert Chairman and Co-founder of Boostmi and Richard Coughlin, Director Sponsorship NASCAR Canada | TSN, Alex unveiled the new livery of his 2018 NASCAR Pinty's Series Chevrolet Camaro racecar. "I am extremely proud to welcome a co-title sponsor that will please Canadian motorsport fans. RONA is a well-known brand name partnering with Tagliani Autosport/22 Racing for the next two racing seasons," said Alex Tagliani. "It's an honour for us to become part of the RONA family. The number 18 car in 2018 will be an inspiring standard bearer for a Canadian brand that has its origins in Québec. It is a natural fit to be associated with RONA because I have been involved in home renovations and reselling for a long time. It's my favourite thing to do after motor racing. I would like to also thank EpiPen for believing in me for the past six years. It's a partnership that I hold dear to my heart. I would also like to thank my other sponsors: Rotisserie St-Hubert with whom we recently produced hilarious videos that you will be able to watch on their Facebook page, and also Spectra Premium, a technical partner for Tagliani Autosport. We cannot wait to start challenging for the 2018 championship honours with car 18 and to defend our win at the Grand Prix de Trois-Rivières," concluded Tagliani. 22 Racing Team Owner Scott Steckly welcomed RONA to the Canadian NASCAR Nation. "It's a privilege to welcome RONA to 22 Racing with Tagliani Autosport. The New EpiPen / Rona Chevrolet Camaro looks amazing. We have been fortunate to have associations with major corporations, including EpiPen, St-Hubert and Spectra Premium. "It's an honour to have a driver like Alex be part of the 22 Racing family. He is passionate and dedicated to the team and he has a great feel for the car. Since he joined the team, we have improved our road course package significantly. Now, if the 18 team can combine its 2017 performance on ovals with great performances in 2018 on the road courses, it will be a force to be reckon with and could fight for the 2018 championship," said Scott Steckly. Charles Valois of Lowe's Canada addressed the media to underscore how proud the company is to join Alex Tagliani's team for 2018 and 2019. "We are very proud to work with Alex Tagliani and to have him on our team for the sixth year as the official spokesperson for EpiPen Canada. We could not ask for a better spokesman. Alex suffers from at least one food allergy.
. Congratulations to Alex and his team on his new 2018 racecar. I am sure it will be absolutely fantastic and will once again proudly display the EpiPen logo. Tag will be a tough man to beat this year." "Rotisseries St-Hubert is proud to once again support Alex Tagliani in his quest for top-honours in the upcoming 2018 NASCAR Pinty's Series season. Alex is a passionate person and his values echo those of St-Hubert. That is why we like to say that he is part of our extended family. As a spokesperson for EpiPen, Alex is involved in raising awareness of food allergies that affect thousands of Canadians. He has emphasized the importance of staying safe by ensuring we have an EpiPen Auto-injector in each of our establishments. We also had the opportunity to work with Alex during the recording of Web videos that praise the fast and efficient St-Hubert food delivery system. You can now view the first video on our Facebook page. We wish Alex all the best for 2018!" "Spectra Premium is proud to extend its partnership with the talented racecar driver Alexandre Tagliani for the next two years. He will continue to use the Spectra Premium high-performance racing radiator and contribute to its evolution. We wish him an excellent season in the NASCAR Pinty's Series." "This is a great day for NASCAR fans in Canada and for NASCAR Pinty's series. We are extremely happy to see RONA joining Alex's long time sponsor EpiPen for the next two years. Alex is one of biggest name in Motorsport in Canada and a great ambassador for the sport. He is the best at what he does on and off track. NASCAR fans will now be able to cheer one of the most recognize brand in Canada by following the 18 team. We wish the 18 a great 2018 season." 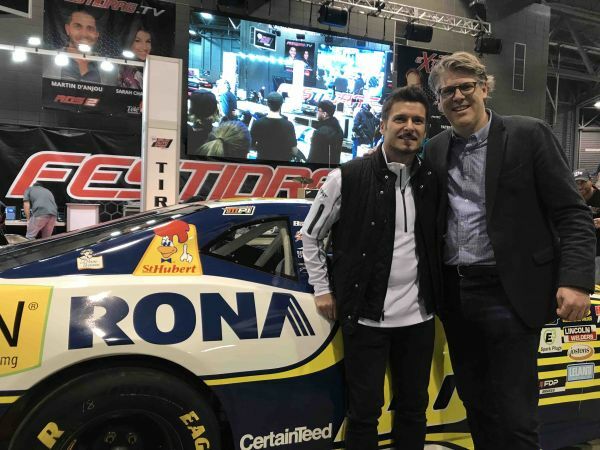 "We are proud to partner with Alex Tagliani because he is passionate and dedicated to his sport, which makes him an incredible goodwill ambassador. A good roadside assistance service for people on the road is like a good race team to its racecar driver. Our dream was to get involved with NASCAR, and we are now part of it. We are excited to join a winning team and to be associated with an impressive list of sponsors in this new venture. Through our racing program we want to show how people can have a winning roadside assistance service." "We can't wait for the 2018 season opener and we are happy to be involved." 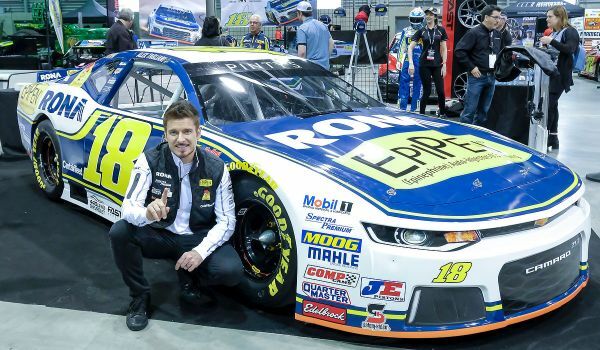 "We are excited to welcome RONA as co-title sponsor of Alex Tagliani's #18 car in the NASCAR Pinty's Series. Alex is one of Canada's biggest stars and a great ambassador for the sport, making this iconic Canadian brand a great fit with his race team and our race fans across the country. We are looking forward to an electrifying race season and are proud to have RONA on board for the ride." Fans can log on the Facebook page of Alex at https://m.facebook.com/Tagliani to watch the replay of the unveiling of the Tagliani Autosport with 22 Racing car in Quebec City on Facebook Live. You can also follow Tag on Instagram @Tagliani18 as well as on Twitter @Tagliani at https://twitter.com/tagliani during his season-long quest for top honours in the NASCAR Pinty's Series. The 13-race 2018 NASCAR Pinty's season will debut the weekend of May 18-20 at the Canadian Tire Motorsport Park in Ontario. During the course of the season, drivers will travel from Nova Scotia to Alberta, with a double-header stop in Saskatchewan, a Saturday headline race at the Toronto Indy in July, and run as the feature event at the Grand Prix of Trois-Rivières in mid-August.